The deliciously effervescent new novel from Celia Imrie, beloved character actress and author of Not Quite Nice, follows the exploits of two women on a cruise ship. The phone hasn’t rung for months. Suzy Marshall is discovering that work can be sluggish for an actress over sixty–even for the star of a wildly popular 1980s TV series. So when her agent offers her the plum role of Lady Bracknell in The Importance of Being Earnest in Zurich, it seems like a godsend. Until, that is, the play is abruptly cancelled under suspicious circumstances and Suzy is forced to take a job on a cruise ship to get home. Meanwhile Amanda Herbert finds herself homeless in rainy Clapham. The purchase of her new apartment has fallen through, and her children are absorbed in their own dramas. Then she spots an advertisement for an Atlantic cruise and realizes that a few weeks onboard would tide her over and save her money until her housing situation is resolved. As the two women set sail on a new adventure, neither can possibly predict the questionable characters and strange dealings they will encounter, nor the unexpected rewards they will reap. 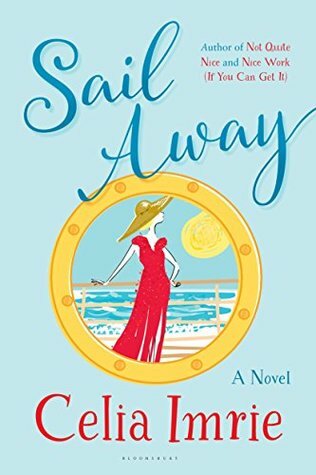 Vividly evoking the old-world glamour of a cruise ship–and the complex politics of its staff quarters–Sail Away is at once a hilarious romp and a thrilling adventure. Sail Away by Celia Imrie is a contemporary story with a bit of mystery involved. The book follows two different women as they both go about their lives with their paths being drawn together and crossing. Suzy Marshall is an out of work actress that finds that jobs get harder and harder to obtain now that she is in her sixties despite being on popular programs years before. When her agent contacts her with an opportunity she immediately gets excited thinking she will finally have something to pay the bills but when things fall through Suzy ends up finding work aboard a cruise. Amanda Herbert has also fond herself in a bit of a bind now that she’s older. Planning to sell the home she had raised her children in she never expected the flat she had planned on moving to to fall through. But with both of her adult children unable to help and no where to go Amanda finds that it would be much cheaper to board a cruise for the weeks she needs a home than to stay at a hotel. Being a lover of cruising of course I had to pick up this title as soon as I saw it if for nothing else than to see what this author does with a story aboard a cruise ship. After reading I have to say the actual story of Suzy and Amanda was quite interesting with a bit of a mystery going on with my only drawback being it did move a bit slowly. However, as far as the cruising side I kept finding little details that didn’t add up to me along with times that the story lost the feel of the setting completely and could have taken place anywhere. Now as far as not feeling authentic to me I have only cruised out of the U.S. and on bigger lines so it could be a case of not familiar with this type of ship/cruise though. Along with the setting side though this review copy had a ton of errors which normally I’d overlook but that also brought my rating down a tad and led to this just being an OK read for me. Celia Imrie, author of the novels Not Quite Nice and Nice Work (If You Can Get It) and The Happy Hoofer, a memoir, is an Olivier Award–winning and Screen Actors Guild–nominated actress. She is known for her film roles in The Best Exotic Marigold Hotel and its sequel, Calendar Girls, and Nanny McPhee. Imrie recently appeared in Bridget Jones’s Baby, Absolutely Fabulous: The Movie, FX’s new comedy series Better Things, and King Lear at the Old Vic. She lives in London. Nice review as always Carrie. It sounds like you’re being generous with your 3 stars given the errors and setting issues. Thanks! I actually did like the story and how it all ended up connecting at the end so I didn’t want to go too low either. Definitely a dilemma for you, then – well done on the honest review!